Following the recent leak of an official Samsung video of the forthcoming Galaxy X folding phone, which was posted to, and quickly removed from, Samsung Vietnam's official YouTube channel, we can now get a better look at how the new folding phone will look when it's released. That's because our Nederlandse vrienden over at LetsGoDigital have fired up their rendering machines to create a 3D image of the handset which only appeared in the Samsung video for a second or two. 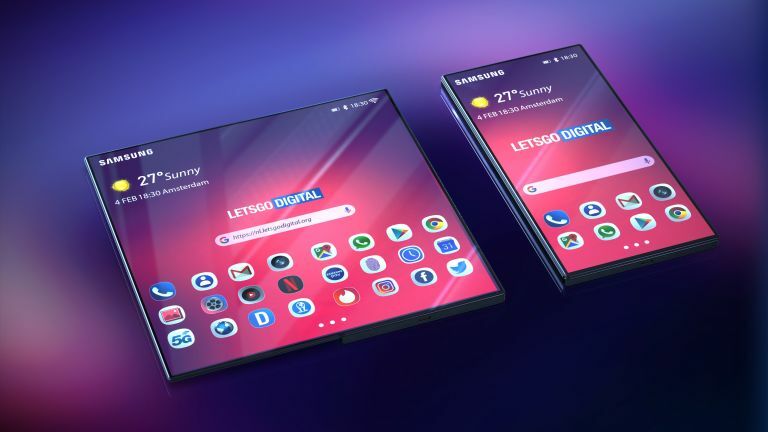 LetsGoDigital says it has spotted some noteworthy differences between the foldable Galaxy X that can be seen in the teaser video and the device that was shown last November at Samsung's Developer Conference. That's a relief because the (disguised) handset shown on stage in November was hardly the most svelte smartphone in the world. The video shows that the final Galaxy X will be much thinner than the earlier prototype. Also, the home screen shows four app icons displayed side by side, while the device shown in November had a row of five icons. LetsGoDigital points out that this four-icons to-a-row design aligns with the Samsung One UI official images. Finally, the bezels on the phone shown at Samsung's Developer Conference have all but vanished – and there's no notch or punch-hole for the camera, which suggests that it could be placed under the screen. Or could the Galaxy X be getting the same pop-up camera which is apparently destined for the Galaxy A90? We'll find out soon enough. Samsung has an event scheduled for February 20 where it will launch the Galaxy S10 range of smartphones and MWC 2019 kicks off on Monday 25 February. We'd expect the Galaxy X to be shown off in its final form at one of those events, since Samsung will surely want to grab the limelight ahead of the expected folding phone announcements in the form of the Huawei Mate 5G, the Xiaomi MIX Flex, the LG Bendi, the highly anticipated Motorola Razr 2019, and a second, as-yet-unnamed Motorola folding phone.